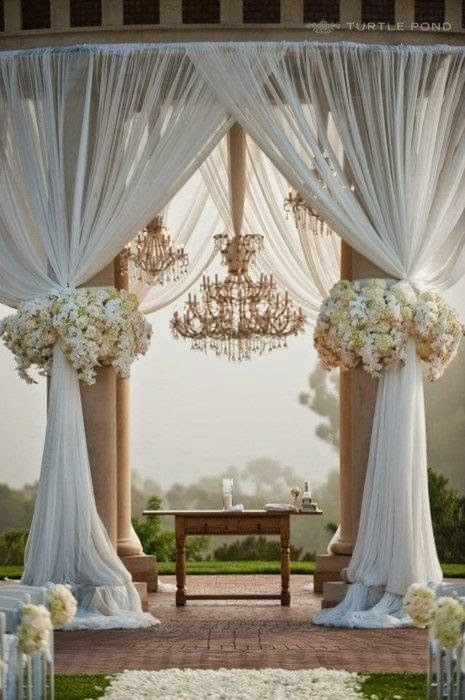 Ceremony decor is becoming increasingly popular- not only in flowers, but in other elements as well. As couples seem to be exploring lots of other venue options, including outdoor venues, the creativity and detail put into making a ceremony unique and romantic is more important than ever before. Thus, we receive lots of ceremony pictures from Pinterest and other sites from our clients. The following photo is one that we have seen quite a bit over the past few wedding seasons. When we see this photo in an email or on a Pinterest board from our laptop, we think the size and perspective are more easily seen. However, we realize that the majority of our clients do their searching and pinning from their phones, which is where we think some of the confusion about the size and scope of these flowers comes from. What may be hard to see from a phone is that this is a very large structure judging from the thickness of the pillars that the fabric is covering. Just based on that, the flower garlands must be pretty substantial to make such an impact on the very wide concrete pillars. Another thing to notice is the chandelier. Let’s guess that it’s at least four feet in diameter. The flowers garlands, though most likely pictured slightly in front of the chandelier, appear to be a similar span and height. For even more perspective, here is a picture that we have never gotten from a client, but is a shot of the same ceremony and structure, fully decorated. With the help of this photo, we can all see that this is a pretty awesome venue with a pretty awesome flower budget to match. The scope of this is not easy to pick out from the first photo, especially on a smart phone or other smaller device. We have had some clients that just want this look and we were able to make suggestions on how to achieve it at their venues and with their structures. This picture represents one end of the spectrum when it comes to perspective and scope in the photos you see from Pinterest and other similar sites. It’s easy to pin something or take it to a design meeting without really knowing what it is. Any professional who enjoys her work will be glad to educate you about your choices to mimic your pictures as best they can. But why not try and self-educate as much as possible? Look for other objects in a picture to help you gain some idea of size. Also, compare apples to apples when it comes to your venue verses an inspiration picture. 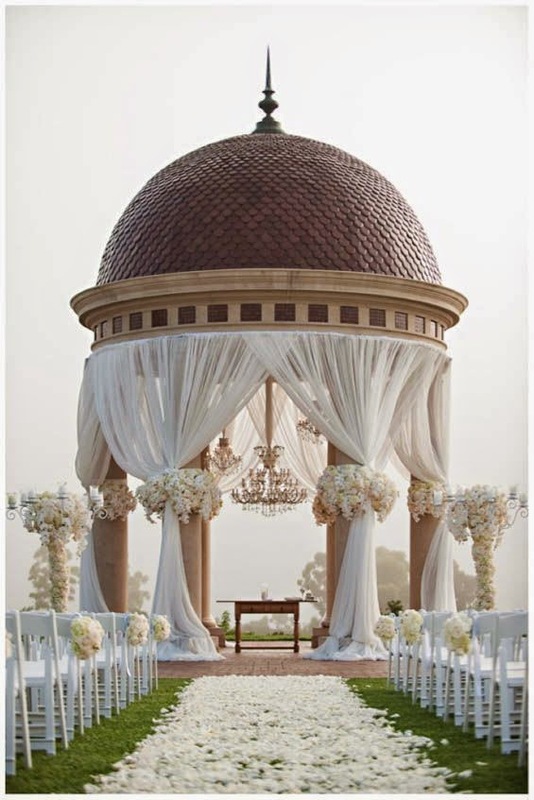 If you don’t have a structure for your ceremony at all or one that can support this look (rounded pillars vs. canopy or arbor) you may need to adjust your expectations. Pinterest can be a great tool to get some visual ideas of the look you envision. Don’t forget to look a little closer at your favorite inspiration pictures to help yourself better articulate that vision.